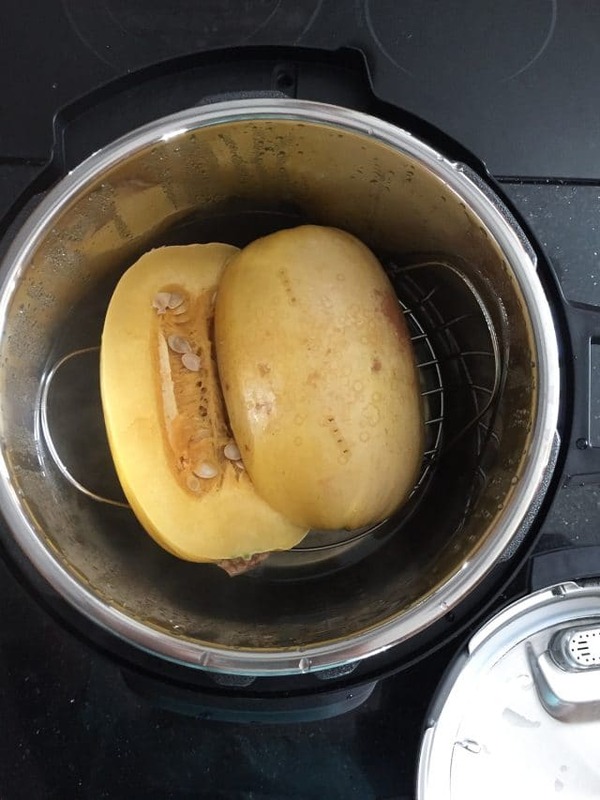 Here is how to cook spaghetti squash in an Instant Pot. 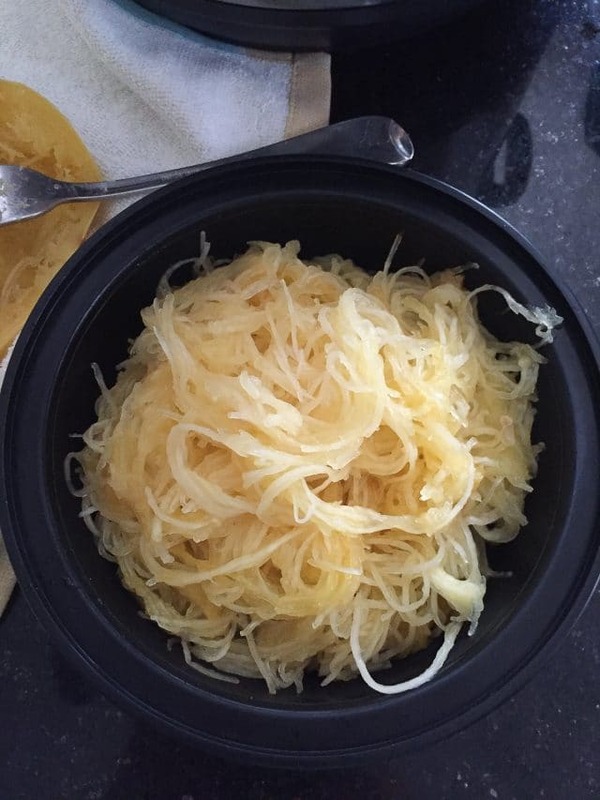 Preparing Spaghetti Squash for dinner or meal prep couldn’t be more easy! Ok, I’d like to take a survey – how many of you have purchased an (affiliate link –>) Instant Pot this year? How many have been pressure cooking all along? I know it’s been popular for some time, but since the Instant Pot has come on the scene, I’ve noticed this method of cooking has become a bit of a thing. For good reason! Just read all the reviews! I purchased my Instant Pot on Amazon Prime day at a great price (like the Black Friday deal). I will admit to you, it sat in the box on my dining room table for months. Over time I took it out of the package and admired it, but it stayed on the dining room table. Something about me – I am not good at reading manuals, I really just like to jump in and start using stuff. But something about jumping in and using something like a pressure cooker just scared me a bit, if I may be honest. 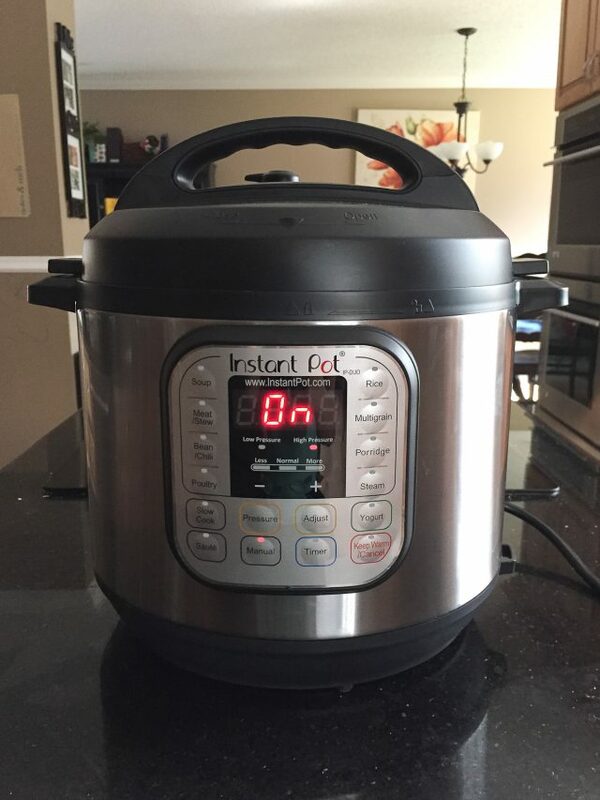 My friend Jennifer uses her Instant Pot ALL THE TIME (she says it’s “Magic!”) and I was starting to get a little jealous. After having lunch with her one day I decided it was time … and with her hand-holding me through text, I made spaghetti squash. And she was right, it was Magic. 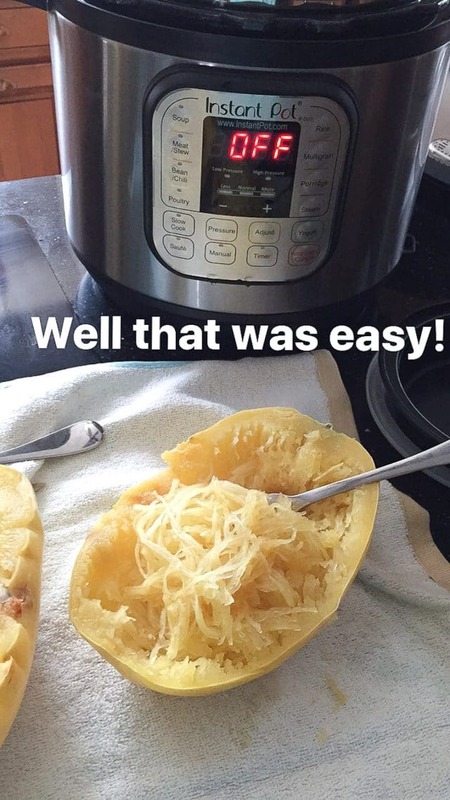 Since this day, I’ve made spaghetti squash in the Instant Pot several times, along with hard boiled eggs, Mexican style shredded beef, shredded chicken and soup. I’ve made a lot of soup in the last week. It is ridiculously satisfying to make soup in the Instant Pot I have to say. A lot of people ask what the difference between using a pressure cooker (or Instant Pot) vs a slow cooker. For me, it’s speed and convenience – and there is a time and place for both appliances. I will not ever be getting rid of my slow cooker that’s for sure, but what I’m loving about my Instant Pot is that I can make what I wanted to make in my slow cooker in a fraction of the time. Since I only loosely follow a meal plan during the week, it’s really nice to know if I change plans I could make something that would have taken hours a lot quicker. I believe my friend Bailey referred to the Instant Pot as “a slow cooker for procrastinators ” and I’ve been saying the same ever since. If you’ve got an Instant Pot sitting on your counter, don’t be afraid. Start with something whether it be this simple Instant Pot spaghetti squash or hard boiled eggs (<— this is the method I use) or a healthy soup like this Chicken and Lentil Soup. I’ve been making a Chicken Vegetable and Wild Rice Soup all week and will hopefully post for you here on the blog soon. I recently spotted this Instant Pot Refried Beans recipe and can’t wait to try it. I’ve been having a lot of fun experimenting with my IP and hope to convert a lot of existing recipes to it. But first, this spaghetti squash. Cooking spaghetti squash ahead is one way I meal prep. It’s so nice to have it ready to heat up, especially if I’m making pasta for the rest of my family for dinner, one less thing for me to do! 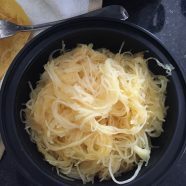 Preparing spaghetti squash in the Instant Pot is pretty simple and straight forward. Carefully cut your spaghetti squash in half longways. 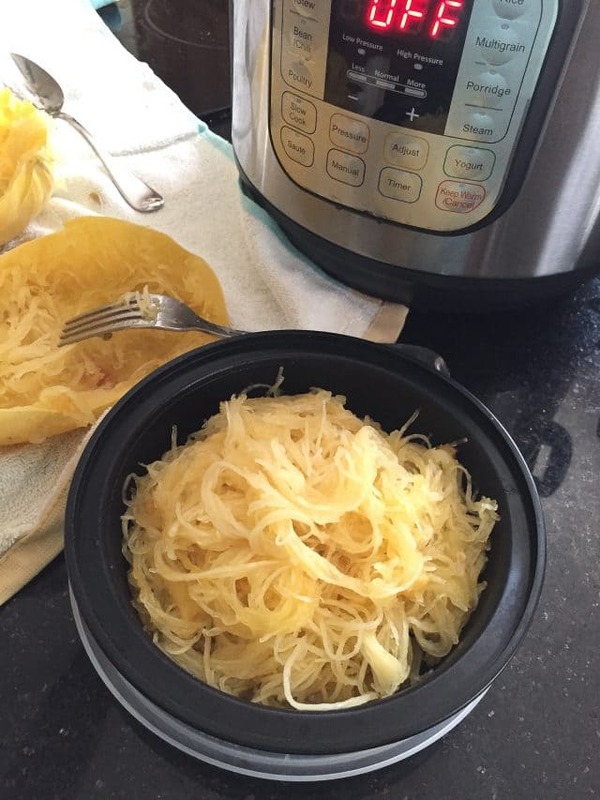 Place your 2 halves of spaghetti squash onto the rack inside your Instant Pot. Add 1 cup of water to Instant Pot and seal lid. Set manual for 7 minutes. It will take a few minutes for Instant Pot to come to pressure. Once timer goes off and cook time is complete, turn quick release knob to release steam (be careful, use a towel for protection or tongs). Release lid and let spaghetti squash cool for a few minutes before handling. Carefully remove spaghetti squash from Instant Pot and set on a towel or cutting board. Using a spoon, take out seeds and discard. Using a fork, scrape out squash strands. At this time, serve as cooked or use in a recipe. I like to make ahead and store in refrigerator for future meals (let completely cool first). Set manual for 7 minutes. Once timer goes off, turn quick release knob to release steam (be careful, use a towel for protection). Aggie, I got your email today. YAY. This is brilliant, looks fantastic. Can’t wait to try! Oh I’m glad Sandy! Thanks! Would love more IP recipes. Love mine!!!! Yea!! I would love to share more! Thanks Nanci! I know IP has rave reviews. I know it. But honestly I’m struggling with purchasing it. Do I really need another appliance in my life?! Is it a fad?! Will I develop a bunch of recipes for it and then it is out? I find my stovetop meals are already quick enough but I get it – spaghetti squash in 7 mins vs 45 is magic. But I really don’t’ want another appliance LOL. I finally unboxed my IP, but still haven’t quite worked up the courage to use it yet. I think this might be a good starting place as I love using spaghetti squash as a base for pad thai. However, when I bake spaghetti squash I normally remove the seeds etc… before baking. Do you think leaving them in helps with the cooking process? Is it a huge pain to remove them later? Thanks! I make soup in my IP once a week now. I love making a chicken, butternut squash (cubed) and wild rice soup. I have been really wanting to share more IP recipes … soon!! Such a great idea Aggie! I am going to feature this post on my slow cooker site, which is transitioning to slow cooker / pressure cooker recipes! I love my instant pot. I make spaghetti squash weekly. I don’t cut mine before cooking and I pressure for 10 minutes than quick release. I think it’s easier to cut after cooking. Do you poke holes in the skin prior to pressure cooking the spaghetti squash? if you were to cook it whole I would, but if cut in half it’s not necessary. It is a pretty amazing kitchen tool isn’t it? As for spaghetti squash, you can totally scrape out seeds before you steam it in the IP (or however you decide to cook it). I find it pretty easy to scrape out soft after cooked, but most people I’ve gotten feedback from usually scrape them out ahead of time. I haven’t tried spaghetti squash with brown sugar and butter but I’m sure that is delicious! !